Apple spent almost $3.4 billion on research and development over the course of its second fiscal quarter of 2018, a $602 million year-over-year increase that brings the company's six-month spend on future operations to nearly $6.8 billion. Detailed in a Securities and Exchange Commission filing on Wednesday, Apple's $3.38 billion outlay accounts for 6 percent of its net sales for the three-month period ending in March. The figure is down about $29 million from its record-setting 2018 holiday quarter. Though smaller on a sequential basis, the investment represents a significantly higher percentage of total net sales. Apple typically allots 4 percent or 5 percent to R&D — 4 percent in quarter one — leaving the 6 percent doled out this period on the high end of its range. The company last hit 6 percent in the third quarter of 2017, just prior to the unveiling of iPhone 8 and iPhone X. As usual, Apple fails to detail where, exactly, the money went. Today's filing offers the same boilerplate description of ongoing development of new and updated products and services, new hires and material expenses related to R&D expansions. Apple and other tech companies routinely grow R&D expenditure as their product offerings mature, a necessary commitment for the sustainability of existing businesses. Still, the increase in spending, as it relates to quarterly net sales, hints at work on projects that go beyond product maintenance. Apple is widely rumored to launch a trio of new iPhone models later this year, two of which will boast OLED screens. The company is looking to capitalize on the success of its first OLED handset, the iPhone X, which has been the best-selling iPhone since its launch in November. During an earnings conference call on Tuesday, CEO Tim Cook said the March quarter was the first to see in which the most expensive iPhone was also the most popular. Beyond iPhone, Apple is investing heavily in augmented reality. 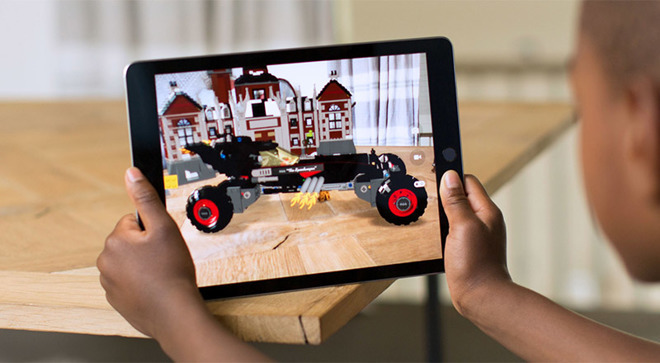 The company's efforts have so far been limited to iOS and ARKit, which recently received a few new features with the release of version 1.5 in iOS 11.3, but rumblings suggest big plans for the technology. Apple is reportedly hard at work on an AR headset referred to internally as "T288." Little is known about the device, but a report last week claims current plans involve two 8K displays — one for each eye — a separate computing unit and integration with advanced communication technologies like WiGig 2.0 or 802.11ay. The company is also moving ahead with its autonomous vehicle platform built from the remnants of "Project Titan." Currently being evaluated on California roads by what is thought to be a fleet of 45 vehicles, Apple's initiative is believed to encompass self-driving software and supporting hardware for use in third-party cars. Other investments could include development of cutting edge health-monitoring components like a glucose sensor for Apple Watch, next-generation AirPods, a smaller HomePod speaker, branded high-end headphones and more. Including R&D, Apple reported total operating expenses of $7.53 billion, or 12 percent of net sales. Apple bought back a record $23.5B of AAPL shares in Q1 as Wall Street peddled "full panic mode"